AIM Monitor is a handy network utility to capture and log AIM (AOL Instant Messenger) chat from computers within the same LAN. It supports not only messaging through AIM server but also direct connection messaging. All intercepted messages are well organized by AIM user with buddies and shown instantly on the main window. It provides rich-features report system to export captured AIM conversations as HTML files for later analyzing and reference. It is very easy to make it to work. Just run the AIM Monitor on any computer on your network, and click the start button to capture. It will record any conversation from any PC within the same LAN. No additional program installation is needed on the monitoring target computers. Everything will be recorded without being detected. It is especially useful for administrators or parents, who need to monitor what their employees or kids are talking about with others on AIM. You may need to enable your switch’s monitoring feature, which is supported by most current switch, in order to capture conversations from other computers in the same network. 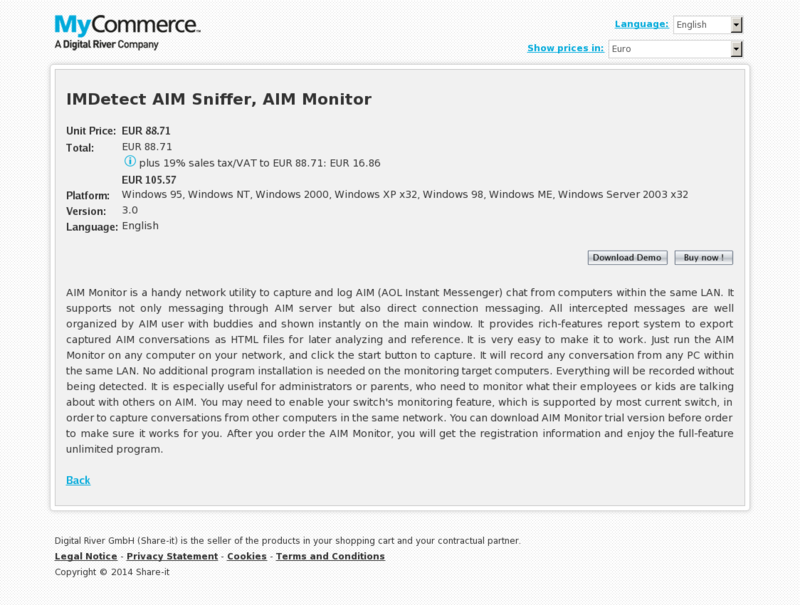 You can download AIM Monitor trial version before order to make sure it works for you. After you order the AIM Monitor, you will get the registration information and enjoy the full-feature unlimited program.